Families love the Safety Turtle Water Immersion Pool Alarm for protecting young children, pets and seniors around open water. The alarm activates when a person or pet wearing a Safety Turtle sensor falls into a pool, spa or other fresh water. The Blink1 from Motorola is a remote WiFi camera that turns any Internet-enabled device into a fully functional video baby monitor. (It an also be accessed via cellular but carrier charges may apply.) 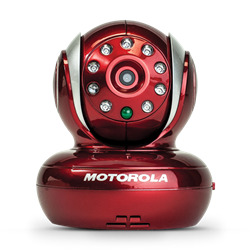 Watch real-time video and sound in your baby’s room or use the video playback. Features include infrared night vision for low light viewing of little sleepers and a remote pan, tilt and zoom camera. With a ClearBlue Bluetooth TV/Audio Amplifying System, teens can crank up the volume on their TV or music player without disturbing anyone else in the house! This stylish wireless headset reduces background noise and delivers crystal clear stereo sound. The system is compatible with all TV, MP3 players and cellular phones and features a built-in microphone for talking on a cell phone. Range is up to 33 feet. Teens will love the LightOn Mobile Phone Signaler by DreamZon so they’ll never miss a call or text when their cell phone is set on “vibrate” and the ringer silenced (like when they’re supposed to be studying!). 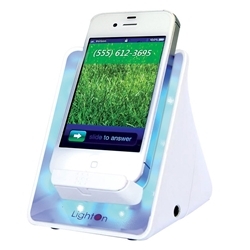 When a new call or text message is received, the LightOn cell phone cradle senses the vibration and alerts the user with a brightly flashing LED light. Teens will have no more excuses for missing class or being late for work when they have the Sonic Alert Sonic Bomb Jr Alarm Clock on their nightstand. With an extra loud 102 decibel ringer, pulsating flashing red light and powerful vibrating bed shaker, even the deepest of sleepers will wake up on time, every day! Pet lovers will enjoy this unique high-tech gift that let’s them see the world through the eyes of their pet. The EYENIMAL Pet Video Cam is a miniature video camera that attaches to their pet’s collar and films up to two-and-a-half hours of sound and video. The Pet Video Cam has a 4GB flash memory and plug-and-play feature. 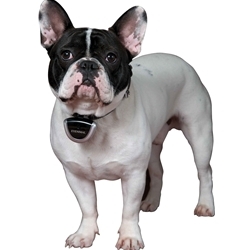 This new dog collar does it all – it’s a handheld dog trainer, a GPS dog tracker and an invisible wireless dog fence! The D.E. Systems Border Patrol TC1 is completely portable and easy to set up anywhere there’s a GPS signal. Pet owners can use it at home, in the field and on family trips. Works for dogs over 35 pounds. The guy who has everything will want to protect all of his stuff, and the KJB Security Sleuthgear Zone Shield Night Vision Clock Radio does just that. This revolutionary device looks like an ordinary clock radio but it is actually a hidden camera that can see up to 20-30 feet in complete darkness. The receiver features SD recording capability, USB and RCA output, and gives the user easy remote view using Internet access. 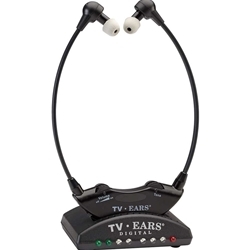 Whether your guy is hard of hearing or just likes to crank up the volume while watching his favorite team, the TV Ears 5.0 Digital TV Listener lets him enjoy television at his preferred volume. Unlike some analog models, digital TV Ears amplifies voice pitch frequencies above other sounds, so words, whispers and accents are easy to understand. Works with just about any TV. Comes with a wireless headset that recharges on the transmitter base. If your guy has a remote, outdoor place where he needs to keep track of the temperature (like a barn, vineyard or remote cabin), the new Temperature@lert Cellular Solar Temperature Monitor is the solution. It’s solar-powered, so it needs no electricity. And because it communicates via cellular, it doesn’t need a landline phone or Internet connection. It’s also weatherproof, so it withstands extreme environments. Temperature alerts are sent by phone call, text or email. Here’s a novel gift to keep families safe from one of the most common causes of household fires – clothes dryer vent fires. These unexpected fires can occur when a build up of lint blocks the flow of air, resulting in excessive heat. A LintEater Dryer Vent Cleaning System makes cleaning the vent hose quick and easy, minimizing fire risk and making dryers more energy efficient. Pair it with a LintGard Dryer Safety Monitor which indicates when the lint buildup is reaching dangerous levels. A weather alert radio automatically announces official, up-to-the-minute information on weather, local hazards and other emergencies. 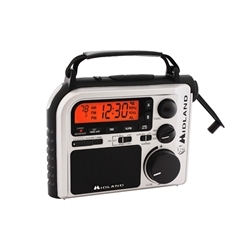 The Midland ER-102 7-Channel Emergency Crank Weather Radio with its four power options makes a great gift for any household. If there’s a power outage or the batteries are depleted, this radio still works by using the hand crank. Receives and reports NOAA weather alerts and has AM/FM stations, a built-in flashlight and an alarm clock. No one wants to lose an entire refrigerator or freezer full of food because of a tripped circuit breaker or power outage. The Refrigerator/Freezer Power Outage Alert alerts you anywhere inside your house with both audible alarm when a designated outlet loses power. The operating range is 2,500 feet so it’s great for monitoring appliances located far away and out-of-sight in the basement or garage. 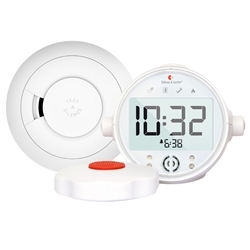 This set comes with a Dakota Alert 2500 Universal Transmitter which supports up to four water or motion sensors. Vacation homeowners will appreciate this simple device that protects their cottage 24/7 from water damage, high or low room temperature, sump failures, smoke, carbon monoxide, water level, motion and more. The DIY Cellular Alarm for Homes monitors any two emergency conditions (plus power outages). If there’s a problem, the alarm instantly sends a text message to up to three cell phone numbers. For homes where landline phone and Internet are turned off during the off-season, a cellular alarm is the perfect solution. 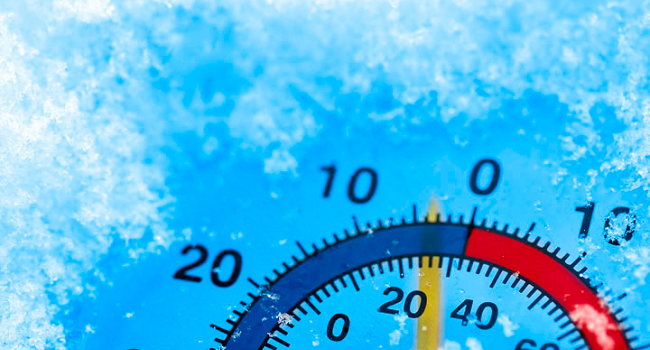 Power outages and furnace failures can occur at anytime, resulting in a dangerous drop in indoor temperature that can cause pipes to freeze and burst. 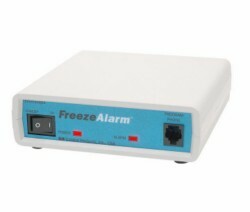 A freeze alarm, like our popular Intermediate Freeze Alarm model, is the best protection against this kind of catastrophe. If the power goes out or the indoor temperature gets too low, this freeze alarm automatically calls up to three phone numbers. Homeowners can also call in from any phone to get temperature, power and battery status. Washing machine floods can go undetected for days or weeks in an unoccupied vacation home, spilling 500 gallons of water per hour onto the floor! A Floodstop Washing Machine Valve Shutoff Kit prevents this kind of disaster by immediately turning off the hot and cold water supply as soon as it detects water under or near the washing machine. Easy to install and provides 24/7 protection. The techies on your list will love being able to control and monitor their home remotely from any web-enabled mobile device with a VeraEdge Z-Wave Home Automation Controller system. With this easy yet powerful one-app controller for cameras, door locks, sensors, thermostats and other home automation and security devices (sold separately), you can view and control from anywhere! VeraEdge can control over 220 devices and is compatible with over 1,200 Z-Wave devices from other manufacturers. Technology aficionados are usually big fans of do-it-yourself systems, and this Wisdom Wireless Security System will not disappoint! Rated by “Consumer’s Digest” for having exceptional value, Wisdom Wireless offers advanced wireless technology and a broad range of optional components. Give techies on your list the basic kit and they can design a customized home security system that’s on par with a professional installation. The Venstar ColorTouch® is the advanced program-it-yourself thermostat that’s both attractive and easy to use. You can even customize the background of the touch-screen display with your own photos! For techies who want the option of remote temperature control from their smart phone or mobile device, get the Venstar ColorTouch Thermostat with built-in Wi-Fi. 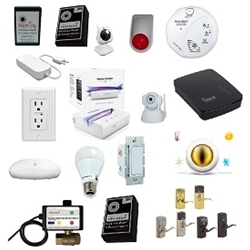 Here’s an affordable wireless security system that installs in minutes. The STI Burglar Stopper System is controlled by a Smart Panel that monitors wireless sensors in up to 8 zones. Comes with 2 door/window sensors but accommodates an unlimited number of optional wireless sensors. Also includes 1 motion sensor and a remote key fob controller. Because there are no wires to run or holes to drill, it’s the perfect solution for older homes. This outdoor surveillance system is for anyone who wants to guard their home, business or property. The Swann DVR16-3200 TruBlue Digital Video Recorder system puts surveillance in the palm of your hand with live viewing on a 3G/4G-enabled smartphone and tablets including, iPhone, iPad, Android devices and more using the free SwannView Pro app. The Swann TruBlue DVR16-3200 comes with 8 clear resolution 700TVL weatherproof cameras that have powerful night vision capable of seeing up to 82 feet (25m). 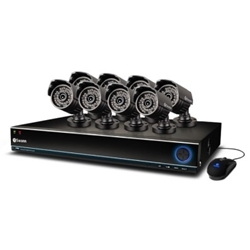 Can be expanded by adding 8 cameras of your choice for full 16 channel monitoring. No one wants to open the door to strangers! With a Chamberlain Doorbell & Intercom System, they won’t have to run that risk ever again. Includes a doorbell with a built-in speaker that transmits up to 1,000 feet away to the weather-resistant intercom. Both units are wireless, battery powered and portable. This voice-controlled “reminder” clock provides seniors with an easy way to remember medications, appointments, bill payments, tasks, etc. — without having to touch any buttons! Reminder messages are recorded in the user’s own voice. Reminder Rosie plugs into a wall outlet for power, but backup batteries retain the clock time and alarm settings during power outages. 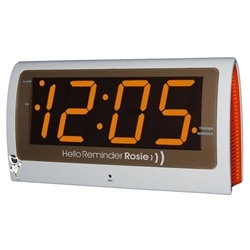 The clock is easy to read with large LED numbers and an extra loud alarm. An amplified phone makes it easier for people with mild to severe hearing loss to enjoy loud, clear telephone conversations. Volume and tone are both adjustable on the Amplicom PowerTel 7 Series Amplified Corded Telephone, which has a corded base, big easy-to-read buttons, built-in answering machine, speakerphone, caller ID and more. System comes with one cordless handset to use in another room. Up four handsets or accessories can be added. If you have loved ones who are hearing impaired and you worry how they’ll know if there’s a fire, get them the Bellman Safe Fire Alerting Solution. 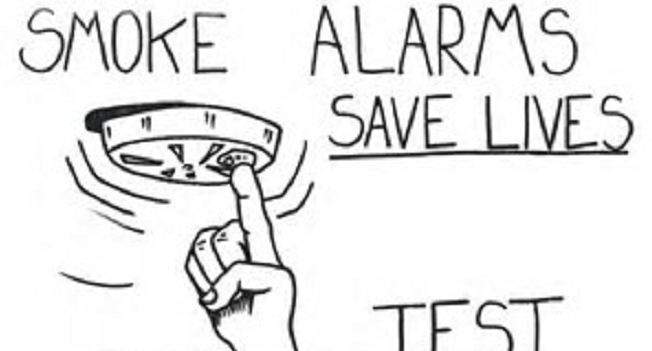 In the event of a fire, the smoke detector signals the alarm clock and bed shaker which triggers an extra loud alarm signal, flashing lights and vibrations. The Bellman Safe Fire System is designed for people with hearing loss and comes complete and ready to use. Seniors living alone need a reliable way to call out for help if there’s an emergency. With a Freedom Alert Personal Emergency Response System, your senior can dial up to four pre-programmed emergency phone numbers with just the push of a button and have a two-way conversation with family, friends or neighbors. If no one answers, the Freedom Alert can dial 911. Works on any standard phone line and has no extra monthly fees. 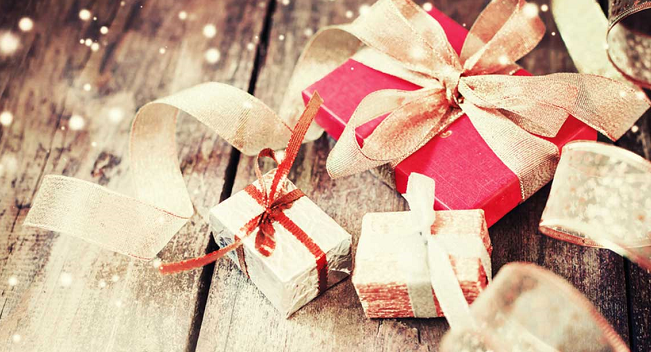 If you are still searching for that special gift and didn’t see it on this list of unique gift ideas, check out the diycontrols.com store site for other great products and holiday deals.